Mark Sylvester, Executive Producer of TEDx Santa Barbara, was blown away the first time he heard Chloe Howard speak. At only 16, Chloe was more eloquent, well spoken and poised than most adults he knew. However, despite all of this, the real reason he was blown away is that she exuded resilience. Chloe was born with a severe foot deformity and spent a large part of her childhood getting operations and learning to appreciate how beautiful she was, despite what others said about her foot. In 2014, she was a victim of assault and bullying at her high school that left her feeling hopeless and self-conscious. Six months later, Chloe had the opportunity to meet U2’s Bono, who is one of her heroes, and he gifted her a guitar that was used when he was writing to the words to “Invisible,” which is one of Chloe’s favorite U2 songs. Inspired by this meeting, Chloe found the strength to start telling her story and submitted an application to speak at TEDx Santa Barbara. 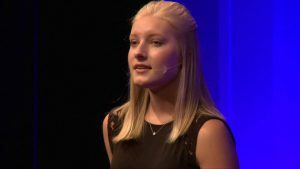 After opening the 2016 TEDx Santa Barbara, Chloe discovered that she had a passion for public speaking and has since spoken at schools, churches and events where she invites people to Stand Beautiful with her to embrace their differences. She is currently writing two books and last summer had the opportunity to travel with Cure International, which is an organization that brings surgical care to children with treatable conditions, like deformed feet, in underserved countries. Most recently, she spoke to the Friends of TEDx Santa Barbara at the Santa Barbara Foundation, who is the presenting sponsor of TEDx Santa Barbara, about the power of labels and the affect that they can have on a person. The Santa Barbara Foundation partnered with TEDx Santa Barbara in 2016 because of shared core values and the desire to bring people together to engage in interesting and challenging conversations to build more resilient communities and partnerships. The foundation is also the presenting sponsor for this year’s TEDx Santa Barbara event on November 11 that is themed “Outside In,” which will include speakers on topics as diverse as the ocean and human trafficking. “For many years, Santa Barbara has contributed to global discussions through its universities and schools and TEDx Santa Barbara gives this community the opportunity to spread these ideas even further, reaching thousands more individuals, and inspiring people, like Chloe, to speak up for what they believe in,” said Sylvester. For more information about the partnership between the Santa Barbara Foundation and TEDx Santa Barbara 2018, or to buy tickets, please visit their website or contact Jordan Killebrew, jkillebrew@sbfoundation.org.